drag and drop, gives the professional output, and is really advanced. It is such a template-creator and website builder that is useful for both IT professionals as well as non IT professionals for the accomplishment of web projects. Owing to the availability of several content management systems, building a website has gone very easy for non IT professionals. Anyone can create a website without having special training in website building. But for the non IT people, one issue arise again, that is template building. Although there are so many templates are available on the internet for download, they all are not tailored to fit specific needs. In that case, TemplateToaster plays an important role in making specifically designed templates. How is it the best for non IT professionals? Because TemplateToaster is a modern template builder that automates template coding thus, a non programmer can make templates easily. People involved into different businesses don’t invest their time in learning programming languages in order to build their website for themselves. TemplateToaster provides them quick solution, within an hour, a template can be created by this tool. That is why, it is the best tool for non programmers. How can professionals take advantage of it? It is a code automation tool, even though, the programmers can take out advantages of it, because it provides script editors also, apart from graphical options for designing. So, the programmers can append externals styles to the templates (and static HTML websites). In other words, management of projects gets easier for programmers and a lot of their time is also saved. Besides, the big advantage for programmers is that they can see the source code and verify the flow of programs, which are made automatically by the tool we are talking about. Because, the TemplateToaster “exports” the source code of user built template on the user’s personal systeminstead of saving that on remote server. The templates and websites generated by TemplateToaster are marked up in HTML5, and styles are given according to CSS3. These are the latest standards defined by W3C. That means TemplateToaster always generates W3C validated and standardized code. Besides following the up-to-date W3C standards, TemplateToaster borrows the consistency of Bootstrap. The code includes the bootstrap bits.A lot of Sample Templates are given free You can pick any sample template that suits your specification and can start customizing that in your way. TemplateToaster has several templates for you to choose from. 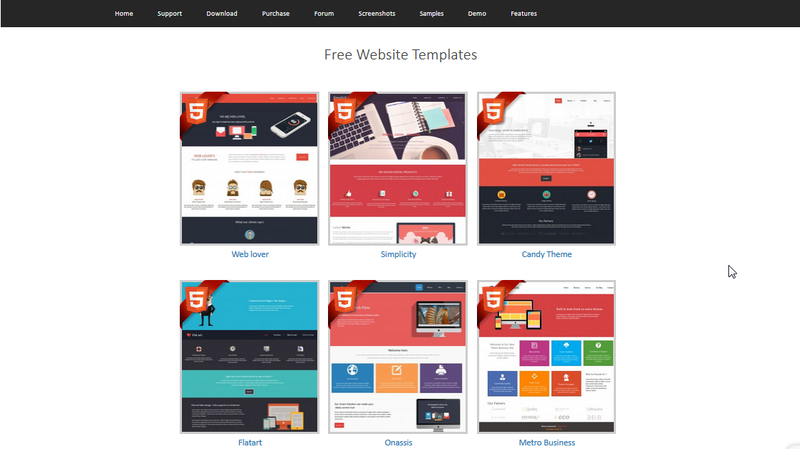 They know that all templates may not be exactly what you have been searching for that is why, you are given the option to design your template or website from scratch. If you really want a better website builder or a custom web template solution, then of course, the TemplateToaster is a good choice. The best part of TemplateToaster is that it lets you design website and templates from scratch, that other similar tools do not allow. Moreover, several templates for different niches are already to choose from, which can be modified to fit into your specifications.